WHAT WILL HAPPEN AT PULSE Leadership institute? 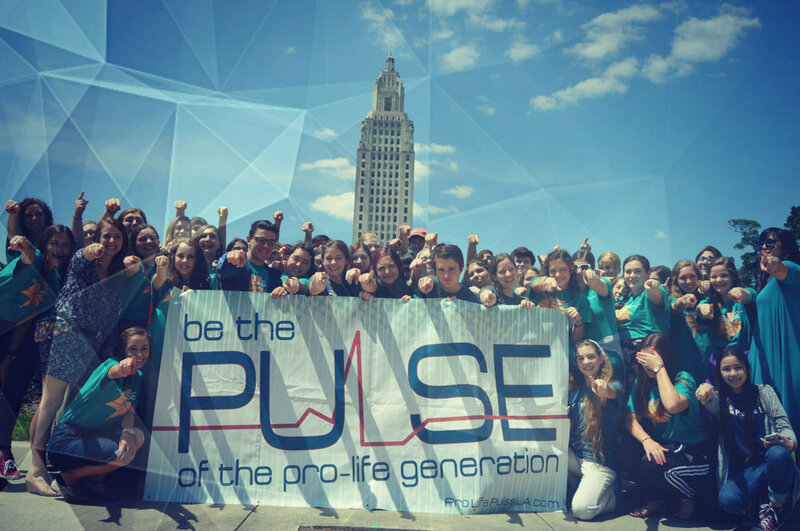 PULSE Leadership Institute will be an exciting week for high school and college students to dive into the pro-life cause. Sessions go beyond abortion into adoption, euthanasia, physician assisted suicide, human trafficking awareness, bioethics, third party reproduction, disability discrimination, and more! With engaging local and national speakers and testimonies, you will be educated on the pro-life issues and inspired to make a difference. With hands-on activism on LSU's campus and testifying at the Capitol, field trips to WNLC and a nursing home, games and Laser Tag, our famous glory night PULSE Coffee House, and a number of activities, you will have a blast at PULSE! PULSE Leadership Institute are open to all high school students of any denomination. The early bird registration fee per student will be $199, and registration will be open in 2019. College students are also invited to participate as college-track attendees and possibly as chaperones, with past PULSE experience. They should contact Krista Corbello at 1.866.463.5433 or krista@prolifelouisiana.org. The event typically begins 3 PM on Monday, with registration opening at 1:30 PM. The event will end at 2PM on Friday. 2019 dates and times TBD. Chaperones and staff, be aware that dates and times will be different for you. Please pack toiletries, towels, and soap. Bug spray, sunscreen, and other outdoor needs are recommended. Clothing should be respectful and casual, and be mindful that it may be cold in the meeting rooms. Ladies, no short shorts, miniskirts, or low-cut shirts. Guys, please wear shirts with sleeves, and no muscle shirts. Feel free to pack your acoustic instruments, frisbees, and other items for our Coffee House Talent Show and free time! Do NOT bring snacks and drinks. No drugs, alcohol, or cigarettes allowed. Please refrain from bringing your laptop computer. While we are fine with using your phone occasionally through the weekend, please do so in moderation, and DO NOT use during sessions. Let your friends know that you are going to PULSE and will not be available for the most part (or encourage your friends to sign up with you!). Any questions unanswered? Please contact one of our Youth Programs Co-Directors!